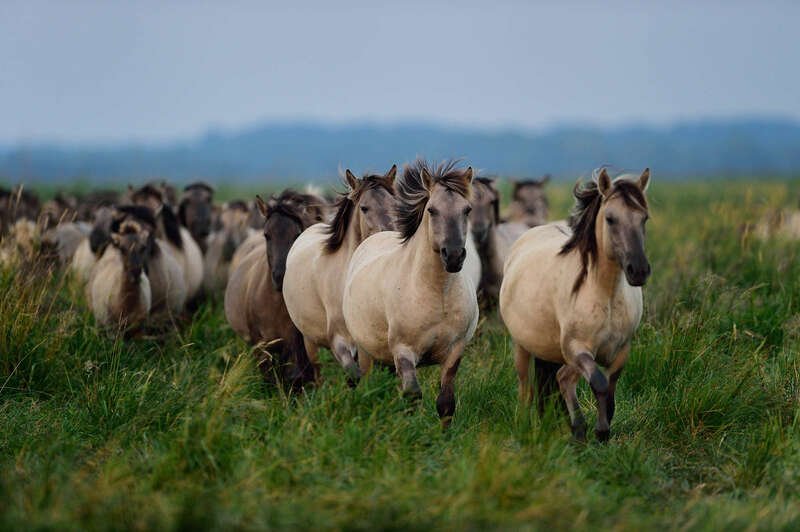 Photographer Solvin Zankl is on a photo mission for Rewilding Europe in the Oder delta, on the border between Germany and Poland. Here is his second blog from the field. I am invited to the Oder Delta Nature Park, a 1000-hectare, private nature reserve near the village Stepnica, on the Polish side of the Oder lagoon (Stettiner Haff in German and Zalew Szczecinsky in Polish). This reserve is owned and run by the Society for the Coast, led by Dr. Kazimierz Rabski. When I start exploring the vast grassland meadows here with their solitarily grown trees, the increasing heat of the midday sun makes the air shimmer. The land here used to be farmland up to World War II, but changed into collective grazing lands after that. In one of these meadows I find a herd of the sturdy and wild-living Konik Polski horses that I was looking for. 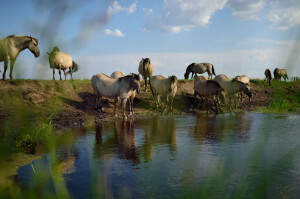 Although the herd is of about 60 horses, they are quite hidden in the high grass. As they calmly walk toward a ditch close by, the trampled edge shows that they regularly visit this place. I therefore quickly position myself close to the water and have my photo gear ready just as the herd reaches the water. When these wild Konik’s lower their heads to the water, the image of an African waterhole with drinking zebras quickly comes to my mind. Some of the horses paw the water and splash around it, others enter it completely to take a bath. As they are not too shy, I reposition myself in relation to the setting sun, in order to photograph them from a very low angle against the evening skies. Eventually, unrest spreads among the horses, for what reason I can’t tell and when one individual decides to trot off, the herd follows suit. I stay behind at the edge of the water and watch them disappearing into the reeds. On my way from the Konik Polski herds at the Odra Delta Nature Park, I stop over in Stepnica, a small fishing village at the Polish side of the Stettin/Szczecin Lagoon. Each morning when the local fishermen return to the harbor they bring along the fresh fish from the catch from the night before: perch, freshwater bream and rudd. 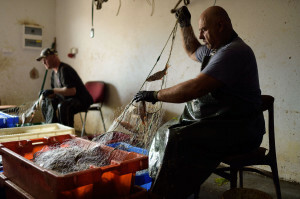 All family members work together to pick the fish from the nets, which then afterwards have to be prepared for the following night’s fishing. Entangled algae and by-catch are removed and the nets are rinsed off. Watching this work, I can sense the tradition that is at home in this harbor. 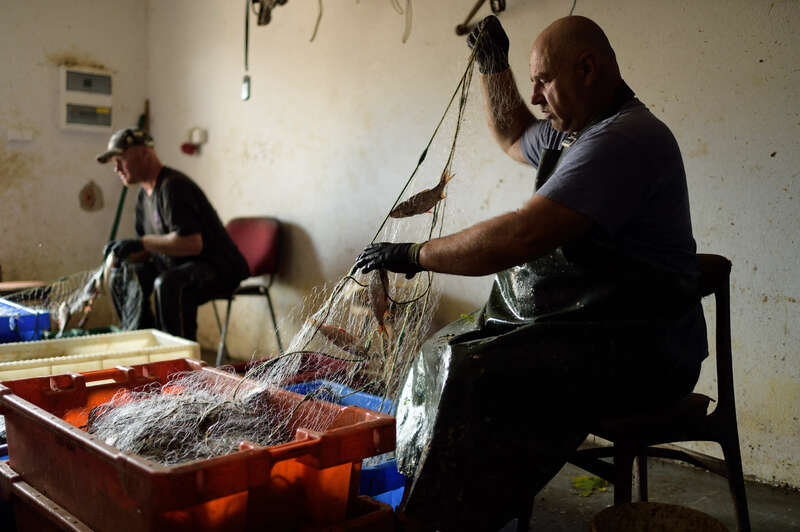 Many generations of fishermen’s families have done this job day after day after day and a young fisherman proudly tells me that he will follow in his father’s footsteps, taking over the family business. The connection between people and nature is very close and obvious here. I deeply hope that people will take care of nature good enough to allow following generations to rely on fishing as well. 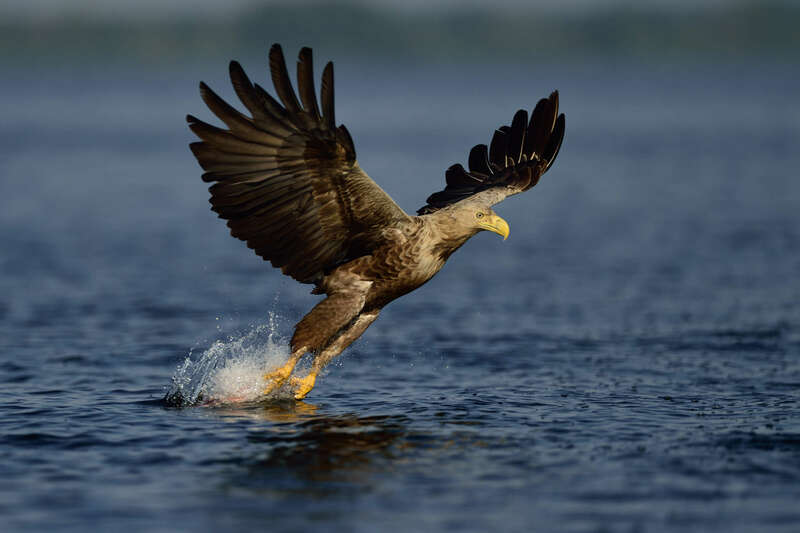 Nowadays, the fishermen of Stepnica also offer all visitors fantastic opportunities to photograph white-tailed sea eagles, because they realised the possible new, additional income from taking visitors on board their boats and showing up these mighty birds of prey, at really close range. The eagles, previously shy from being shot at and persecuted over the centuries before, have now gotten used to making use of the by-catch fish from the fishing and now appear promptly to pick up the discarded fish from the water’s surface. These eagle-watching trips, where you can get nice close-ups of the eagles approaching, snatching the prey and carrying it away in heir claws, today already probably bring in more income to these fishermen than the actual fishing does.